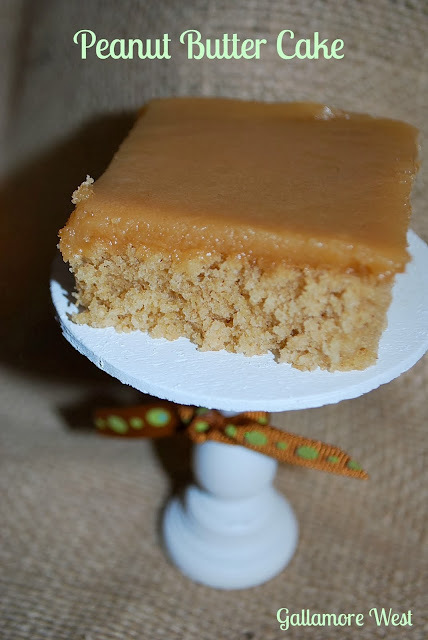 gallamore west: Peanut Butter Cake & Planter's Peanuts! Peanut Butter Cake & Planter's Peanuts! "Science doesn't lie because it's made of facts." It's true! Science is made of facts, and sometimes those facts turn to fun. Like peanuts... let's talk peanuts. Packed with 6 essential vitamins including niacin, Planters peanuts are great for your health. So, pull up a chair, grab a slice of Peanut Butter Cake and watch this 30 second video made by Mr. Peanut himself. Peanuts really are nature's little miracle. Hopefully Mr. Peanut will inspire you to think of creative ways to work peanuts into a recipe for your family soon! Here's my Peanut Butter Cake recipe. If you love peanuts and peanut butter, you will LOVE this. It's my #1 most pinned recipe! Stir well & pout into greased line cookie sheet w/raised sides (jellyroll pan). 3 1/2 c. powdered sugar & 1 tbsp vanilla. Optional: Garnish with Planter's Peanuts! Original post w/printable Peanut Butter Cake recipe can be found here. Enjoy! I'll be trying this one, soon! You are speaking my language-- PB!!! !